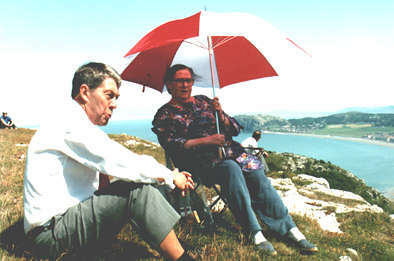 In July 1997 Côr Meibion Colwyn received a chance phone call from Optomem Television who produced the Two Fat Ladies cookery series. 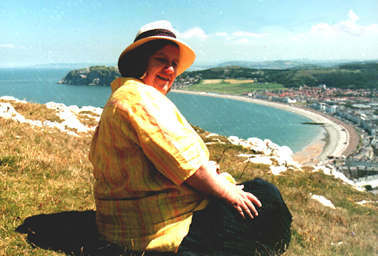 The show’s Welsh-born producer Patricia Llewelyn wanted a Welsh choir to sing in a show they would be making when they came to Llandudno. We sent her our latest recording and within a few days an invitation came to record the programme that same month. 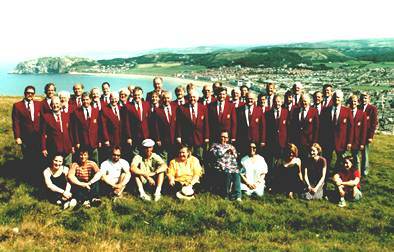 The format to the programme was that the choir would be taken on a picnic onto the Great Orme, a prominent hillside overlooking the Bay of Llandudno, with the food prepared on the programme by Clarissa Dickson Wright and the late Jennifer Patterson. 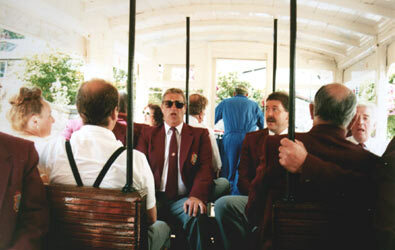 Originally we were asked by the producer just to sing Nant y Mynydd (Mountain Stream), however on the tram taking all of us up the mountain for the picnic the music started early. Jennifer began to sing in her memorable deep and low baritone voice, “clang clang clang went the trolley, ding ding ding went the bell” and we all joined in. The choir then spontaneously sang O Gymru (Oh Wales) and this was also included in the programme as the camera shows the tram going up to the picnic. It was a gloriously hot summer’s day and Clarissa wore a sun hat that she stuffed under her dress while filming, which everyone found amusing. The two ladies were, we suspect, flattered by the attention from all the burly Welshmen. Jennifer took a fancy to Ian, one of our tenors, who serenaded her during a break between filming. 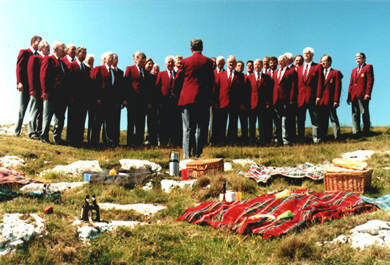 Ian can be seen on the recording asking if they would like the choir to sing for them after the picnic. Also between takes and off camera the choir, under the baton of acting deputy conductor Hugh Pritchard, sang other Welsh songs such as Myfanwy, and both Jennifer and Clarissa sang along with the melodies and tried pronouncing some of the Welsh words. 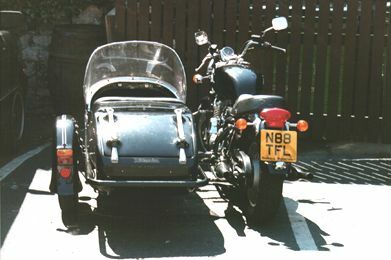 Clarissa later admitted to an emotional tear in her eye following that unforgettable trip up a Welsh mountain. The picnic food was Crème Vichyssoise Glacee (iced leek and potato soup), Welsh Lamb Pie, Provencal Tartine (baguette sandwiches). To drink was good old fashioned ginger beer. It was a beautiful day and the choir enjoyed the company of the Two Fat Ladies as well as the extremely friendly production team. It will remain one of the most memorable days in the choir’s history. We get many enquiries from across the world about the show, our singing and recording. As well as enquiries from Britain and mainland Europe, people have contacted us from as far away as Guam, Hawaii, Australia and many other parts of the USA and Canada.